This is an ancient name of Anglo-Saxon and Old Scandinavian origin, and is a locational surname from any of the places in England named with Old Norse or Old Danish element "thorp", or the rarer Olde English pre 7th Century "throp". 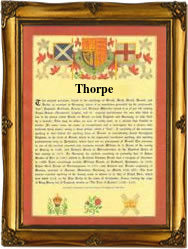 Generally, "thorp(e)" in a placename indicates that it was an area of Danish settlement. The word means a small hamlet or village that grew by colonisation from a larger settlement, and was originally an outlying farm dependent on a nearby village. In the modern idiom there are a number of variant forms of the surname, ranging from Thorpe, Thorp, Tharp and Turp, to Thro(u)p, Thrupp and Thripp. Thomas Thorpe (died 1461) was speaker of the House of Commons from 1431 - 1452. Francis Thorpe (1595 - 1665), who was educated at Cambridge was a witness at Stafford's trial and became a colonel in the parliamentary army, and was later appointed judge for the northern circuit and delivered a "charge" at York justifying Charles 1's execution and also refused to try the northern insurgents. The first recorded spelling of the family name is shown to be that of William de Torp, which was dated 1158, in the "Pipe Rolls of Northumberland", during the reign of King Henry 11, known as "The Builder of Churches", 1154 - 1189. Surnames became necessary when governments introduced personal taxation. In England this was known as Poll Tax. Throughout the centuries, surnames in every country have continued to "develop" often leading to astonishing variants of the original spelling.